When President Bush first landed on the USS Abraham in a fighter jet and announced the end of "major combat operations", with a giant banner behind him that read "Mission Accomplished", the national media lauded the event as excellent "stage craft" and images of the dramatic landing dominated the news. But as the war in Iraq continued, journalists began to question the banner. Had the administration declared victory too soon? Had they misled the public? In October 2003, President Bush officially distanced himself from the banner, affirming that sailors aboard the ship were responsible for it. Still, journalists were determined to get to the bottom of the story, and Elisabeth Bumiller, of the NEW YORK TIMES, spoke with the White House and with several officers from the USS Abraham Lincoln in 2003 trying to track down the banner's origin. She reported in November of that year that the original idea for the banner was first offered by someone  exactly who, "no one really remembers"  in an April, 2003 meeting of White House staffers and USS Abraham Lincoln officers. Whatever its initial origins, the banner has become a powerful symbol. To critics of the administration, the banner has become a reminder of early assurances that the war would be short and cheap. To the administration, the story is a distraction and a distortion of Bush's message. To White House Press Secretaries, it is an annual headache manufactured by Democrats, the press, or both. We've collected some, but by no means all, of these moments below. Press Secretary Ari Fleischer was among the first to handle the "banner question" in a July 2003 press conference. REPORTER:: Ari, you touched on this a bit previously. The President stood in front of a banner that said, "Mission Accomplished." And you today used the term the primary mission was accomplished. But when will the mission really be accomplished? Was that just symbolism? MR. FLEISCHER: No, I think that -- again, this is almost a little more revisionism. Certainly in early May when the President said major combat operations have ended, major combat operations had ended. The President didn't say all combat operations have ended. He used a very specific word with a very specific meaning when he said major, leaving wide open that knowledge -- and he said it to the American people, and he said it remains dangerous -- that combat operations of various levels will, of course, continue. And I think as far as the crew of the Abraham Lincoln was concerned, as they were about to arrive with their families after the longest deployment ever, Mission Accomplished was a great way to summarize what they did. REPORTER:: So when will the total mission -- what is this administration's definition of when the total mission will be really accomplished? MR. FLEISCHER: I think it will be as -- when security and stability are brought to Iraq, when Iraq has a representative government of all the different people of Iraq, when that government is up and that government is stable. And this is going to be a question of some time. If the President in early May said major combat operations have ended, this is just two months later -- why would anybody think, after all the decades that Saddam Hussein had to build up the hate and the destruction in that country, and how many loyalists he had dedicated to helping him carry out the murders and the torture that he had in that country, that in a mere two months, Iraq would look like the United States? It's not the way it works, and it's not the way the President thinks. MR. McCLELLAN: Well, Ben, I think the President was honored to go and thank our troops onboard the USS Lincoln for all that they had done in our efforts in Iraq. He was pleased to go to the USS Lincoln and thank the sailors on board the ship and thank the pilots on board the ship and thank other men and women in the military who were on board the ship. They had completed their mission and were returning back to America, and it was a nice thing for the President of the United States to do on behalf of the nation. REPORTER: But he also declared major combat operations over, and gave the sense that the war was winding down. MR. McCLELLAN: Let's go back and look at his remarks. He also declared that there is more to do, that difficulties remain in Iraq. REPORTER: Well, is it still true that major combat operations are over? REPORTER: Any major combat operations that are still underway? MR. McCLELLAN: That's still correct. MR. McCLELLAN: No, no, no. What he said is still correct, that there are still certainly combat operations and dangers that remain in Iraq, and our troops are doing an outstanding job, they are performing brilliantly in their efforts to bring about a free and peaceful Iraq -- which is critical to winning the war on terrorism. REPORTER: Havoc, he used the word havoc today, could he, would he possibly stand under a sign that says "Mission Accomplished" today as he did three years ago? MR. McCLELLAN: Well, Peter, I think that there are some Democrats that refuse to recognize the important milestone achieved by the formation of a national unity government. And there is an effort simply to distract attention away from the real progress that is being made by misrepresenting and distorting the past. And that really does nothing to help advance our goal of achieving victory in Iraq. REPORTER: It has nothing to do with Democrats. MR. McCLELLAN: Sure it does. REPORTER: I'm asking you, based on a reporter's curiosity, could he stand under a sign again that says, "Mission Accomplished"? MR. McCLELLAN: -- which is what they're doing, does nothing to advance the goal of victory in Iraq. MR. McCLELLAN: Well, I think the focus ought to be on achieving victory in Iraq and the progress that's being made, and that's where it is. And you know exactly the Democrats are trying to distort the past. MR. McCLELLAN: We're on the way to accomplishing the mission and achieving victory. REPORTER: Does the President -- does the President regret the "mission accomplished" speech? MS. PERINO: Look, I've never heard him describe it that way, absolutely not. Let me just remind everybody, in case you need it, that speech there, I encourage people to read it. The President never said "mission accomplished." I realize that the banner said "mission accomplished." That was specific to the mission of that ship. They were supposed to be deployed for six months. They were deployed well beyond that. I think they'd gone to both Iraq and Afghanistan. And that's what that banner was referring to. MS. PERINO: Yes, I get -- no, I understand. That's the anniversary of when that banner flew on that ship. President Bush is well aware that the banner should have been much more specific and said "mission accomplished for these sailors who are on this ship on their mission." And we have certainly paid a price for not being more specific on that banner. And I recognize that the media is going to play this up again tomorrow, as they do every single year. 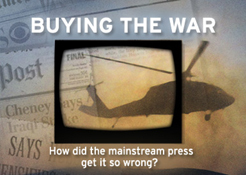 How did the mainstream media get it so wrong in the lead up to the Iraq War? 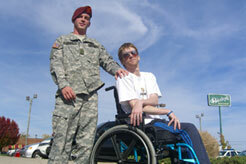 How do you make tangible the true costs of the Iraq war? With photos from Nina Berman's book PURPLE HEARTS. "Keepers of Bush image lift stagecraft to new heights"
By Elisabeth Bumiller, the NEW YORK TIMES, posted on CNN.com, May 16, 2003. "White House Letter; A Proclamation of Victory That No Author Will Claim"
By Elisabeth Bumiller, the NEW YORK TIMES, November 3, 2003.
by Greg Mitchell, EDITOR AND PUBLISHER, May 2, 2003. Bill Moyers reflects on his interview with Reverend Jeremiah Wright. Our political analyst returns to take stock of the never-ending primary season. Victor Navasky and Christopher Cerf's new book MISSION ACCOMPLISHED looks back at what the experts told us would happen in Iraq. Explore the media coverage surrounding the case for war in Iraq with our interactive timeline of video, headlines and documents. 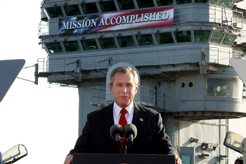 It has fallen to the White House Press Secretaries to defend and explain President Bush's May 1st landing on the USS Abraham and the controversial "Mission Accomplished" banner.